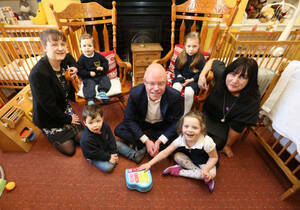 Aisling O’Neill, Meath East Soc Dem candidate (left), Stephen Donnelly TD and Glenna Lynch, Dublin Bay South candidate (right) with children (front) Isobel and Rory and (sitting in the back) Abel Balog and Maja Tazbir in Fitzwilliam Nursery and Montessori School, Herbert Street, Dublin 2 this morning. 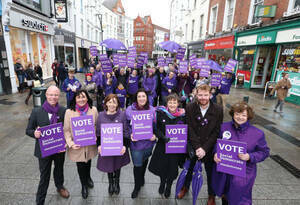 “We’re trying to get a message out on a fraction of the resources available. When the State broadcaster is essentially engaged in censorship of four of the eight political parties three days before the debate, it makes it very difficult. Soc Dem co-leader Stephen Donnelly, on RTÉ’s decision to exclude four of the eight political parties from the leader’s debate tomorrow night. 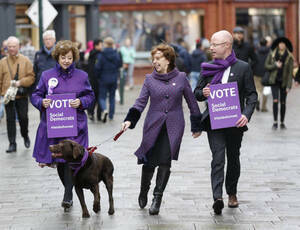 From left: Catherine Murphy, Roisin Shorthall (with unidentified chocolate Lab) and Stephen Donnelly on Grafton Street yesterday. 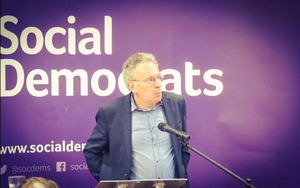 Posted in Misc and tagged Social Democrats at 2:40 pm on February 22, 2016 by Broadsheet. And all because the voters love… fiscally plausible centre-left policies. Trotted out at every wedding and nag race in town. I despise the colour. I,for one, am fond of a nice, sensible beige. 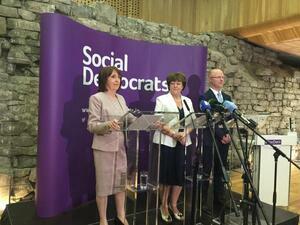 Purple is the Irish beige. BTW it’s about time Joan changed that red coat of hers. She hasn’t taken it off for 2 weeks. Must be a right bang off it. @Dhaughton99 : I don’t think the Irish man is qualified to pass any judgement on how Joan should dress. PS: Those brown shoes, tucked shirt and denim jean clad thunder thighs are a big Non Non. I’d love to know the “Tracksuit per capita” statistics for Ireland. However, there are lots of good looking well groomed lads now-a-days. Always shocked at how trendy they are when I visit home. …seems more appropriate than a left one these days. I’ll get me own coat, thanks. …I couldn’t believe the playback program on Saturday morning ignored Stephen Donnelly’s contribution when reviewing the Leaders debate. I’m no supporter but his contribution was easily the best on the night. The RTE bias is blatent…Terry Prone, Steven Collins and Keelin Shanley last night was like a party political broadcast for the blueshirts…will the clinic issue two invoices? That Prone wan has a gig on TV3 sometimes on that afternoon show with Elaine Crowley – Midday I think it’s called. She comes across as a bit off to say the least. The rest of um do be looking at her like she’s fupping looped. She was saying there recently that she reads 8 books at a time.. 8, altogether, as she’s like a genius or something. She’s like one of these Walter Mitty types of bullsh*tters that people believe for some reason. She was yapping on there too recently about a guy in the office who used to shout out some sort of saying to everyone when he was leaving.. something silly like ‘another day another dollar’, and that it was so annoying she was so glad when he decided to finish up. Apparently companies hire her for things like when an employee had bad body odour and they can’t say it to the employee directly. You need to shower everyday people, sez Prone. What do you do with a wonky head though? She’s definitely seems like she has psychopathic tendencies to me. Elaine Crowley has come out as saying she’s had struggles with her mental health. I wonder is she aware of how of how Prone treated her former employee Kate Fitzgerald? That is an excellent question Anne. I did Clampers, thanks.. I haven’t a bulls notion of how to use Twitter properly, but I’ve sent her a few tweets on it. Or maybe I should retweep it or something.. I’ll try that. I’d say Elaine will block me. Ha. I’ve made a bit of a hames of it. I only follow twitter to get some science articles really. I’ve tweetered and replied to my own tweets including them again. Ah I’m sure they got them anyways, ah more than once though. Purple colour! Chocolate lab? Dying for some Cadbury’s. I’m eating one bar a day for every Social Democrat candidate in my constituency. None that is. Not a fuppin’ Picnic Bar or a Golden Crisp. Did you see the welcome the local AAA crew greeted M.Martin’s FF walk about today? For the Lab alone I would give this party a decently high preference. They had me at ‘woof woof’. Look at how adorable Gorgeous Gary is with his few badges and his purple brolly. I’ve Catherine Murphy. Which is grand, I can butter her up with 4 Number 1’s and she’ll put in a good word for me or slip me his number so I can stalk him. Sound is our Catherine. Aye. I’ve heard 3 separate stories about her from personal friends in the past week. One was denied rent allowance because her rent was too low and Catherine called up to the house to argue with the council about how she and her son were ‘punishing her for being lucky’ with her sound landlord and got that sorted. Another told me how she helped him get a house in a new local council estate while a third told me about how she helped him when he went back to college and was denied the back to education allowance cause he moved home with his parents. She’s top class. Someone who’s in the game out of a sense of injustice as opposed to an ego. Sounds like old-school clientelism and a waste of a good Catherine Murphy tbh. You can’t say it’s distracting her, though. She’s done more than her fair share of national poltiics. It’s when it’s ALL about fixing the road it’s a problem. Correct. It was the Denis O’Brien thing that sold her for me. What other politician has done anything like that? When’s the last time a journalist has? 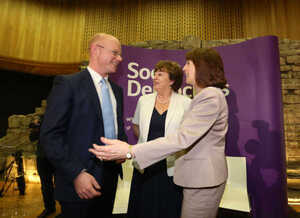 She canvassed my house at the last GE – I didn’t know who she was, even though she’d been a TD in the Dail before last. She impressed me immediately just chatting on the door. Ashamed to say she didn’t get my No.1 because like an idiot I fell for what Labour were saying. Will never make that mistake again! What struck me about her canvass this time was the other people on it. I’ve seen it out twice in my hometown. Average joes. Normal people who want to feel like they’re doing something. A couple of very pleasant pensioners were knocking doors with her the second time while an acquaintance’s ma as well as the chef from a local pub was with her the first time. Meanwhile, I was walking though a car park last week to see the CEO of Rye Lawlor Brewing in his 4×4, waiting. When I came out of the shop, this car pulled up alongside him and 4 lads no older than 26 came out of it with strong, non local, accents. She had people who just want to help alongside her, FG had aspiring civil servants and politicians with him. I guess he’s polling well…………. fnar, fnar! Awwwww stop Clamps, he’d well top my… well nevermind. I wonder what kind of coverage they’ll get from Broadsheet once they get into power. I suppose we should really be boycotting RTE due to their general, ago old bias and propaganda. I still can’t believe we actually pay a license fee to be fed lies. The absolute shocking LIES RTE put out regarding the 80k strong protest last weekend was shameful. I was there. There was 60-80k if there was one. RTE reported 15-20k. So there’s 80k people who went home and saw the lies on the 6 O’Clock News. That’s 80k more people who’ve just had their eyes opened to RTE’s stunning bias. Well done RTE. Showing your colours for all to see. I want one overhead high resolution image of the protest. Once the density and area calculated, easy peasy to calculate crowd size. Saw estimates varying from 10,000 to 100,000. That kind of variation make everyone look idiotic. Crowds are always bigger when you are in the middle of them. 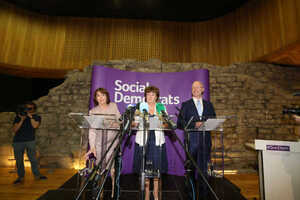 The colour is clever, in that we all now know (well most of us) who purple represents this election, and nobody in their right mind is going to vote against anyone because of their dislike of a colour. Labour started putting up posters in the last week coloured purple! If the labour candidates were to get naked before dipping themselves in purple paint before climbing up a poles & remaining there for the remainder of the campaign, it would still be too late for them. Before anyone shouts, they used the same technique for Marriage Referendum campaign and were more accurate with that than with traditional polling. This is why the study of elections being called a science has always confused me. How in the name of Jayzis can you possibly accurately quantify how many people lied to you in the polls? You don’t need science. Mark my words: Labour are finished. BS, have you changed your mod policy or something? No more #gerruppppppps?!! Wondering this too. Seemed to be some heavy comment culling going on in Gemma O D’s piece the other evening. I can see my #gerrups? You can take our swearwords but you’ll never take our #gerruupp #heygoodlooking #eyecandycentral #getmybibimdrooling!!!! Except Direct Democracy Ireland, because state of them like. Okay yes, not some of the loopy ones like Pegida or whatever. Well said. He has my vote.